I love my job! 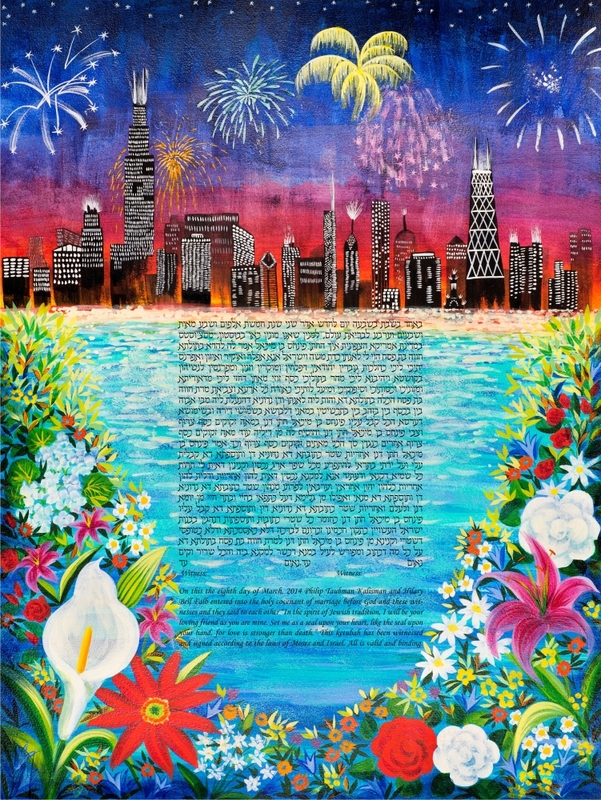 This commission gave me the challenge of creating a ketubah which had similar imagery to a previous work from 2008, which the couple really liked. (See below.) The brides are cousins, so I wanted to be sure that, although the overall colors and imagery were similar, they were still distinctly different. How did I do? I had the privilege of making a ketubah for the sister of the Doves/ Moon Ketubah bride in 2009 (see below.) I love it when my ketubahs become a family tradition, it is truly an honor, and fun to get to know various members of the tribe. 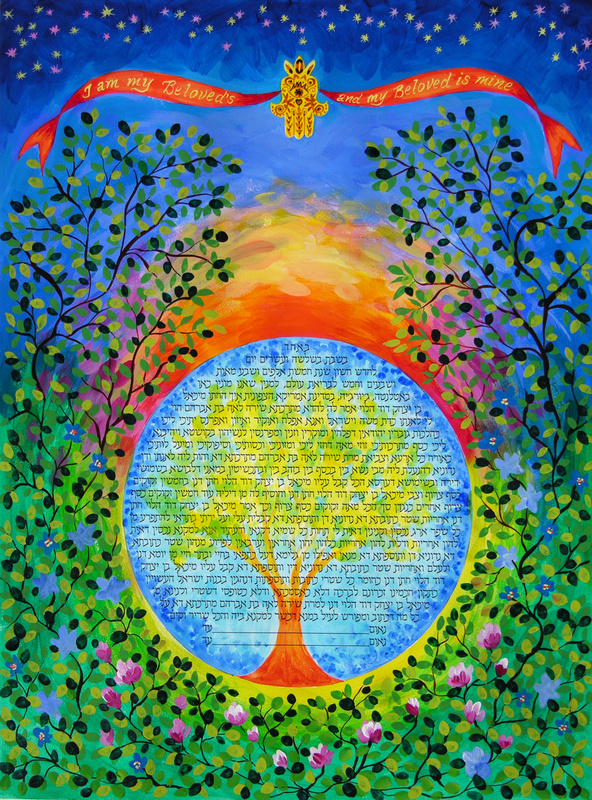 Sunrise Ketubah; 18″ x 24″, acrylic on paper. Simpler custom ketubah, digitally printed text, hand-painted decoration. BLOG TOUR . . .
A wonderful artist and compassionate spirit, Catherine Meyers, from Catherine Meyers Art Blog, invited me to participate in a Blog Tour. It’s been going on for a while, with many wonderful studios involved! So in order to participate, I’ll answer a few questions and then introduce the next couple of artists who will be the next stops on the Blog Tour. Moonlight Stroll Ketubah, hand-lettered, egg tempera paint, 2014, Judith Joseph. 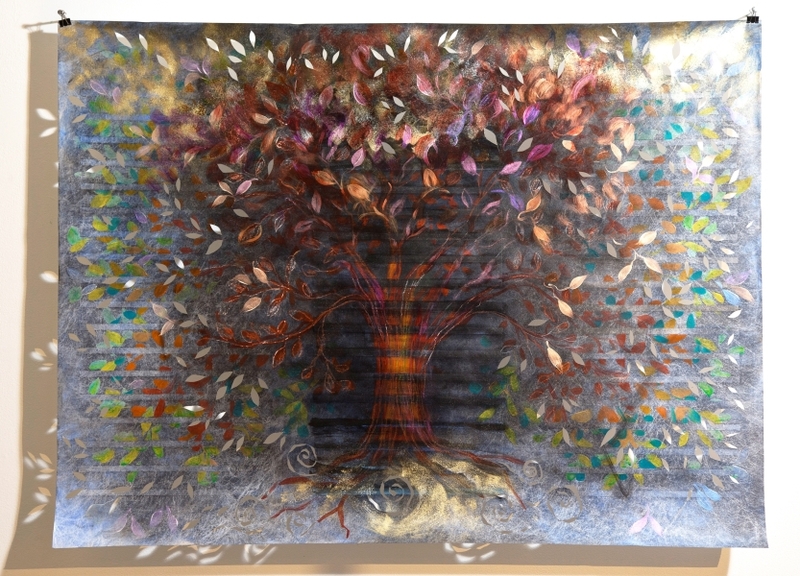 Kaleidescope Ketubah, hand-lettered, egg tempera paint, 2014, Judith Joseph. “Beth”, poem by Judith Joseph, gallery installation 8′ x 5′, 2014. I also participated in a gallery show in March at ARC Gallery called Fractured Yet Rising, about violence against women, where I hand-wrote one of my poems on the gallery wall. How does my work differ from others of its genre? I think of myself as a painter who includes calligraphy, rather than a calligrapher who decorates text. Why do I write/create what I do? I was raised in a family environment that was richly steeped in my Jewish cultural heritage, and text (reading lots of books, learning to read and write Hebrew as a child) was a big part of this. So, it seems natural that text would be an integral part of my artistic expression, along with narrative imagery. I also am a people person, and I find the collaborative aspect of my work to be very joyous and inspiring. How does your writing/creating process work? 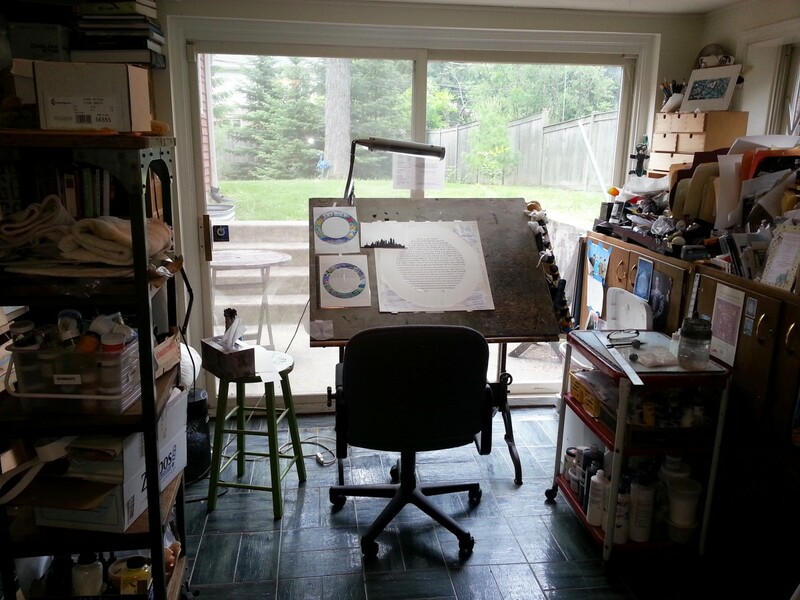 My commissioned work begins with people requesting a ketubah. I interview them and sketch, which leads to the finished work. For work I produce independently, I work with ideas or materials that engage me, and this feels more like play. Ghost Scroll, cut and painted,mixed media, 3′ x 4′. Judith Joseph, 2014. So, now you know a little more about me, let me introduce you to the next amazing artists in the tour. 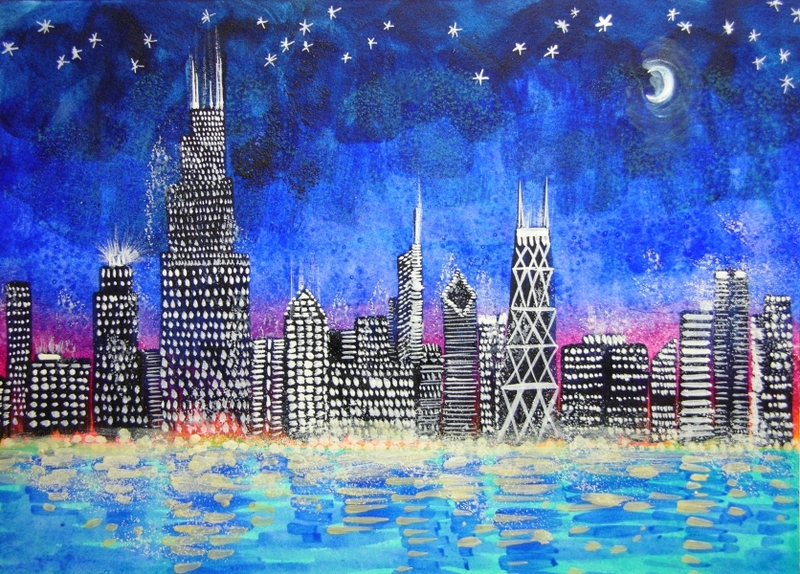 Peggy Schutze Shearn is a Chicago area painter whose work incorporates letterforms, abstract calligraphy and text into colorful semi-abstractions. Her sense of color and pattern is gorgeous. Nancy Charak is a committed abstract expressionist who makes paintings and drawings in Tucson, Arizona, recently transplanted from Chicago. Her watercolors are sensitive and reflective of nature. Blake’s beautiful mom, Raina, just married her beloved, Jeff, and they asked me to create a ketubah for them inspired by the earlier painting I had done for Blake and Cam. So much joy and fun for our family this year! Blessings and joy to both couples! See it here on my website. 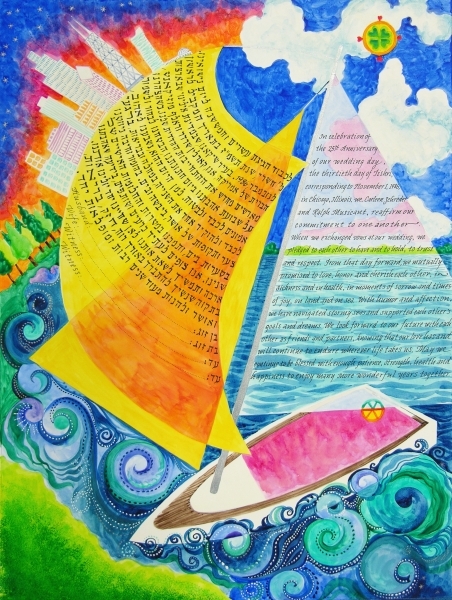 The Jewish Art Salon and the Kraft Center present: Get Lucky: Amulets and Ketubah Art by Judith Joseph. Art Exhibit curated by organized by the Jewish Art Salon. 7 – 8 PM Panel Discussion Still, Small Voice in a Noisy World: Jewish Heritage and Contemporary Art. Panelists: Judith Joseph, Alison Kruvant and Isaac Peterson, moderated by Buzz Slutzky. Exhibit Hours: April 18 – May 20, Sunday – Thursday 9-8, Friday 9-1. The art of Judith Joseph springs from illuminated manuscripts: decorated, hand-written texts. She loves miniature medieval illustrations with their quirky, often bizarre imagery that ranges from holy inspiration to bawdy violence. Her love of letters encompasses both their calligraphic form and the story they tell. She started making ketubahs (hand-written, decorated Jewish marriage contracts) at the age of 17, beginning a journey with this art form that has lasted decades and produced some 500 commissioned, original works. She has grown up with the ketubah, and it has grown with her. Judith’s paintings often contain Hebrew lettering. Her series of hamsa (amulet) paintings began when she painted one for each of her three adult sons, when they moved far from home. She used unstretched canvas, so the paintings could be easily rolled and transported from place to place. 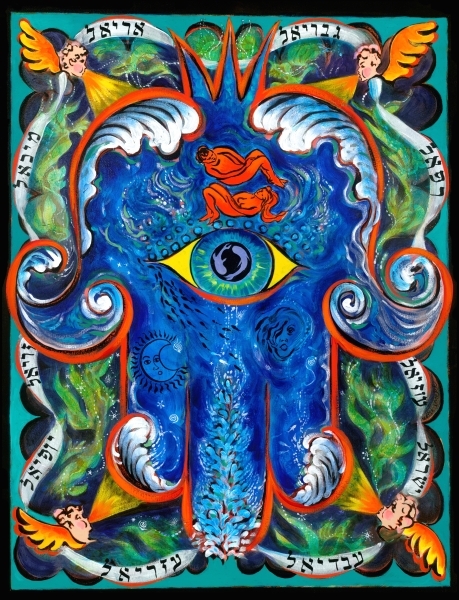 She used thehamsa symbol: a hand blocking the evil eye, an ancient image found in Mediterranean countries. The hamsa is often worn during childbirth. Directions: #1 Train to 116 St, Buses M4, M5, M104 to 116 St. M60 Bus from 125 St Metro-North. 606 West 115th Street, just west off Broadway. The Jewish Art Salon is a global community of artists and art professionals. It organizes exhibitions, panel discussions and programming with leading international artists and scholars, in order to create an appreciation for innovative Jewish art in the contemporary art world. I just finished this ketubah for an anniversary celebration. (See my preliminary sketch here. The original sketch included their Briard dogs, but we decided to leave them out. ) It was commissioned by a couple who spend much of their time sailing on Lake Michigan. In the photo above, my artistic life is graphically bookmarked. On the left is Rabbi Fred Wenger with his lovely bride, Rochelle. 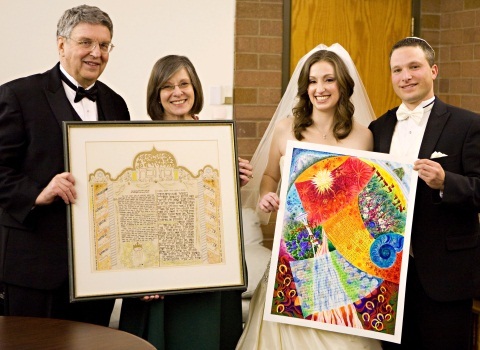 At the age of 17, I made the ketubah for their wedding (which they are holding). It was Fred’s idea: he’s the kind of guy who recognizes a spark of potential in a person and nags them until they blossom. It came about because I was an arty kid, and I mentioned to Fred that I had discovered a Jewish folk art I hadn’t seen before: the decorative ketubah. Fred’s response was, “You know, I’m getting married this summer. Why don’t you make my ketubah?” To which I answered in typical teenage fashion, “I don’t know how. It’s too hard. I wouldn’t know where to begin.” Fred coached me. He knew that I had enough Hebrew and artistic background to pull it off, and to say he lit a fire in me is an under-statement. The last time I saw Fred and Rochelle in person was sometime in the 80’s, when they were still living in the Chicago area. They later moved to Salt Lake City, Utah, where Fred was the rabbi at Cong. Kol Ami until he recently retired. They raised their two children, Haim and Miriam, and when Miriam announced her engagement, they called me to say that they wanted to commission me to make her ketubah as their wedding gift to her. I told them that they’d have to come up with something else to give Miriam and her fiance, Daniel, because this one’s on me. The amazing thing is: Miriam and Daniel have my first second-generation ketubah, and their parents have the first one I ever made. It was truly beshert (destined): I had another couple in line to be the first second-generation couple, but they changed their mind. The universe intended for this milestone to be in the hands of the Wenger-Landis family. Perhaps it seems grandiose to say that the universe put it’s big hand into this little arrangement. But, when I look at the photo: at the primitive, shaky, faded work done by a kid who didn’t know about archival materials, yet expressed the exuberance of discovery; contrasted with a ketubah that reflects my life’s work (so far) of making ketubot, it moves me. What also moves me is seeing the faces of my dear friends, who were shy, coltish, crazy-in-love kids when I made their ketubah in 1973, and how well life has turned out for them. They are beloved in their community, have years of good works that have helped many, and have raised two wonderful and successful adult children– now they have Daniel in the family, too! We move through our lives, as my dad says when I ask him how he’s doing: “Just plodding along.” We seldom get the opportunity to take stock of where we came from, and where we’ve arrived. This photo does that for me. I feel very blessed to have met Fred and Rochelle, and for the tremendous impact Fred made in my life by simply saying, “Why don’t you make my ketubah?” It reminds me that we all can have this impact, if we pay attention, and put our energies towards positive things, for ourselves and in encouraging others. Being a free-lance artist isn’t an easy life; it is constantly challenging and frustrating at times, but this is more than offset by the joy I experience in making ketubot as a collaborative art form. If you’d like to see Miriam and Daniel’s ketubah close-up, and some more, too, click here.